1 of 2 Heat oven to 375 degrees . In a large bowl, combine pork, egg, scallions, garlic, bread crumbs, cilantro, brown sugar, lime juice, fish sauce, soy sauce and sriracha. Form into 24 meatballs. Place meatballs on a rimmed baking sheet coated with nonstick cooking spray and bake at 375 degrees for 20 minutes. 2 of 2 Slice baguette pieces lengthwise and spread 1 tbsp mayonnaise on bottom half of each. 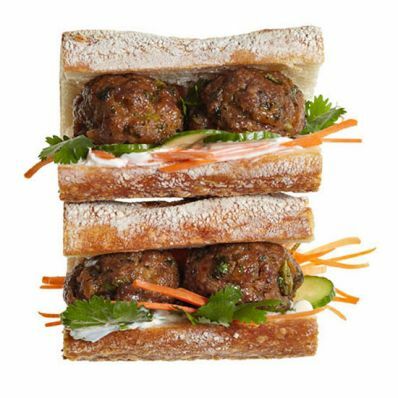 Top with grated carrot, sliced cucumber and cilantro, then place 4 meatballs on each. Finish with sriracha. Serve warm. Per Serving: 7 g sat. fat, 95 mg chol., 24 g Fat, total, 566 kcal cal., 1150 mg sodium, 26 g pro., 3 g fiber, 62 g carb.